The Chilean Navy (Spanish: Armada de Chile) is the naval force of Chile. The origins of the Chilean Navy date back to 1817, when General Bernardo O'Higgins prophetically declared after the Chilean victory at the Battle of Chacabuco that a hundred such victories would count for nothing if Chile did not gain control of the sea. This led to the development of the Chilean Navy, and the first legal resolutions outlining the organization of the institution were created. Chile's First National Fleet and the Academy for Young Midshipmen which was the predecessor of the current Naval Academy were founded, as well as the Marine Corps and the Supply Commissary. The first commander of the Chilean Navy was Manuel Blanco Encalada. However the famous British naval commander Lord Cochrane who formerly had been a Captain in the Royal navy, was hired by Chileans to organize and command the Navy. Cochrane recruited an almost all-anglophone complement of officers and midshipmen and crews of British, Irish and American seamen. He became a key figure in the war against loyalist forces in Peru and was instrumental in taking control of the fortresses of Valdivia even though he failed in his attempt to conquer Chiloé Island. In March 1824, the Chilean Navy and Army undertook an expedition to expel the Spanish from Chiloé Archipelago. An expedition was dispatched to Chiloé Island however ended in failure when the Chilean Army led by Jorge Beauchef was defeated at the Battle of Mocopulli. It was only after Ramón Freire's Chiloé expedition in 1826 did the royalist forces at Chiloé under the command of Antonio de Quintanilla, surrender and Chiloé joined the new Chilean nation. After the wars of independence, a series of conflicts demonstrated the importance of the Navy to the nation. First of these conflicts were the War of the Confederation (1836–1839), the Chincha Islands War (1864–1866) and the War of the Pacific (1879–1883). The founding of Fuerte Bulnes in the Strait of Magellan marked the starting point of a series of Chilean Navy explorations, led by navy hydrographers like Francisco Vidal Gormaz and Francisco Hudson, in the unknown zone between the Strait of Magellan and Chiloé. To deal with this new area of activity the navy founded in 1874 the Hydrographic Office whose first director was Francisco Vidal Gormaz. The Chilean war hero and martyr Arturo Prat is regarded as the ultimate example of the commitment of the Navy to its country, after his death while leading a boarding party onto the enemy ironclad Huáscar at the naval battle of Iquique on 21 May 1879, during the War against Peru and Bolivia. The anniversary of this battle is celebrated every year as a public holiday called Día de las Glorias Navales. Prat is also considered to be one of the co-founders of the Naval Seaman Training School in 1868, which began operating a year later, and was one of the Naval Academy's finest graduate officers that in 1943 it became the National Naval School "Arturo Prat" in his honor. The Navy further distinguished itself during the Battle of Pisagua in 1879, led by both the Navy and the Marine Artillery Groups and Marine Infantry, the world's first modern military landing operation, that resulted in Chilean victories in other parts of Peru's Tarapaca region, and resulted to its annexation by Chile. With the Peruvian Navy destroyed, Bolivia becoming a landlocked country and Argentina having only a brown-water navy the Chilean Navy had a regional hegemony in the years following the War of the Pacific. To secure this advantage and not letting new Argentine acquisitions challenge Chilean Naval power the Chilean government decided to modernize its navy. The modernization plan included the ordering of two cruisers, two torpedo boat destroyers and the modernization of two armoured ships in English docks. A new pre-dreadnought battleship, Capitán Prat, was ordered under the new construction program in 1889. The advent of the 1891 Chilean Civil War saw a breach between the two branches of the Chilean Armed forces, while the bulk of navy sided the congress side the majority of the Chilean Army remained loyal to José Manuel Balmaceda. When the majority of the national congress broke relations with the government Jorge Montt took control of the fleet at Valparaíso and with notable politicians, like Ramón Barros Luco, on board the fleet sailed north to the nitrate-rich Tarapacá area which Chile had seized from Peru ten years earlier. Tarapacá was by that time Chile's richest region in terms of natural resources and was without the fleet practically out of reach for the Chilean Army. From here the navy organized an army made of nitrate miners which they armed and trained to face the 40,000-men strong Army of Chile. In August 1891 the new army was disembarked in Quintero and defeated the Chilean Army at the Battle of Concón and the Battle of Placilla before the presidential faction disbanded and the congressional side took power. On the elections of October 1891 Jorge Montt was elected president. Not all navy officers sided with the congress. Some like Juan Williams Rebolledo, Juan José Latorre and Policarpo Toro remained on the presidential side and Francisco Vidal Gormaz declared his neutrality. After the war these officers were removed from their offices. 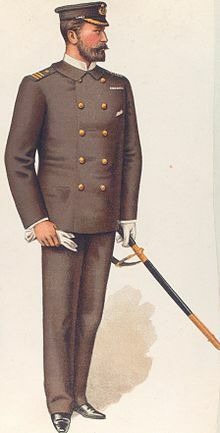 In contrast to these officers whose career or influence in the navy was truncated by the war, the 1891 Chilean Civil War served as a starting point of a successful career in the navy for a generation of young officers like Francisco Nef and others who sided with the congressionals who won the war. After incidents with Chile in 1872, 1877 and 1878 Argentina had decided that a brownwater navy, even if modern, was not enough to back up its ambitions in Patagonia and the South Atlantic. Both countries were distracted in the next few years by Argentina's internal military operations against natives and Chile's War of the Pacific against Bolivia and Peru, but by 1890 a full-fledged naval arms race was underway between the two. The Boundary treaty of 1881 between Chile and Argentina had been a major success in laying the groundwork for nearly all of Chile's and Argentina's 5,600 kilometres (3,500 mi) of shared borders, but the drawing a boundaries in the largely unexplored inland Patagonia soon became a major source of territorial disputes. Over the 1880s and 1890s Chile and Argentina engaged in an arms race fueled by nationalistic rhetoric and tax income from their blooming economies. Both countries signed a treaty in 1902 to end the arms race. During the 1890s, the Chilean Navy carried out many hydrographic surveys in the Patagonian channels aimed to improve navigation and explore the river basins of Patagonia. A German geographer, Hans Steffen, led navy explorations to western Patagonia, laying the groundwork for colonization of what would be Aisén Region years later. The Navy occasionally collaborated with European naturalists such as Carl Skottsberg in their surveys of Chilean territory. In 1904 Brazil ordered two Minas Gerais-class dreadnoughts to be built by the United Kingdom. In response, Argentina ordered two Rivadavia-class dreadnoughts with an option for a third from the United States. They also ordered twelve destroyers from three nations in Europe. With its major rival acquiring so many modern vessels,[A] Chile was forced to respond, though this was delayed by a financial depression brought on by a major earthquake and a drastic fall in the nitrate market in 1906 and 1907, respectively. [B] Eventually Chile ordered two Almirante Latorre-class super-dreadnoughts and six Almirante Lynch-class destroyers from British shipyards, but received only two destroyers before the rest were purchased by the Royal Navy during World War I; of these Chile would finally receive three destroyers and one battleship, the Almirante Latorre, after the War. Chile also received six British H-class submarines from the Royal Navy in 1917, and purchased three Capitan O'Brien-class submarines and six Serrano-class destroyers in the late 1920s. However its fleet of cruisers, all built in the 1890s, were totally outdated by the time the Great Depression forced their retirements without replacements. In 1931, the navy once more made headlines in Chilean politics when large portions of it (26 ships) began a mutiny that demanded the president to rescind a salary reduction. The demands were later expanded to include an agrarian reform, industrial "solidarity" and the payment of the external debt by the "millionaires". The mutineers had their ships located at Coquimbo and Talcahuano's naval base which they controlled. Chilean government responded by sending the Chilean Air Force to bombard the ships in Coquimbo and charging Talcahuano's naval base. After the quelling of the rebellion the navy was purged, even though the mutiny had its origin among the lower ranks. These economic and political factors, along with Chile's neutrality for much of World War II, meant that the navy did not acquire any warships until after the War. Chile formulated its Antarctic claim in 1940 and in 1947 the navy established the first Chilean base, Captain Arturo Prat Base, in the continent before the Chilean Army or Air Force established their own bases. Since then the navy has played a major role in supplying Chilean bases and performing numerous rescue missions among them of MS Explorer in 1972 and 2007. The Navy's most recognizable sailing school ship, the Buque Escuela Esmeralda, began operations in 1952. It since has made various trips around the world, with selected cadet officers and NCO's on board trained in ship handling and operations, as a requirement for graduation. Prior to the Esmeralda, another sailing ship, the General Baquedano fulfilled the same functions. Beginning in the 1950s, the Chilean Navy began to be involved in a series of incidents with the Argentine Navy and Argentine civilians in the disputed area of Beagle Channel and Cape Horn. This incidents took both form of incursions into Chilean waters by Argentine fishing ships and provocations such the shelling of a Chilean lighthouse by the Argentine Navy during the Snipe incident of 1958. During the critical phases of the Beagle conflict of the late 1970s the Chilean Navy played a decisive role in defending Chilean sovereignty over Picton, Lennox and Nueva islands that the Argentine Navy planned to seize. While Argentina aborted its invasion plan, Operation Soberanía in December 1978, Argentina went rather into war with the United Kingdom in the Falklands just after 4 years. During that conflict the Chilean Navy provided diversion to favour the British, as it was understood that if Argentina won the war they would once again try to seize Picton, Lennox and Nueva and Cape Horn. 1964 would see the birth of the modern Chilean Marine Corps of today. Naval educational institutions were reformed in 1968 when president Eduardo Frei Montalva created the Naval Specialities Schools System with headquarters in Las Salinas Naval Base in Viña del Mar. One of its schools, the Naval Seaman Training School, became the Seamen's School of the Navy "Captain Alejandro Navarrete Cisterna" on the same year as its centenary, in honor of the first naval seaman to rise through the ranks to become a naval officer. The NSSS soon became the Naval Polytechnic Academy in 1995, through a merger of all its component schools, some of these schools staying as independent constituent academies. After the 1973 Chilean coup d'etat together with the Army, the Air Force and the Carabiniers, the Navy, led by Admiral Jose Toribio Merino became part of the Government Junta led by Army commander in chief Augusto Pinochet, and upon the latter's resignation from the Junta leadership in 1981, Adm. Merino became its chairman until March 1990, presiding over its sessions and those of the Legislative Commission, and was also concurrently the National Defense Minister. The training ship Esmeralda functioned as a floating prison and torture chamber for political prisoners during the 1973–1980 period of the military dictatorship. It is claimed that probably over a hundred persons were kept there at times and subjected to hideous treatment. It was also an unprecedented period of growth and expansion of the naval service as more vessels became part of it, the Marines strengthened and the Navy's special forces unit raised. The 25,000-person navy, including 5,200 Marines, is directed by Admiral Julio Leiva Molina Martin as of 2017. Of the fleet of sixty-six surface vessels (soon to be increased to seventy-four), twenty-one are major combatant ships based in Valparaíso. The navy operates its own aircraft for transport and patrol; there are no fighter or bomber aircraft. The Navy also operates four submarines and a tender ship to support them, all based in Talcahuano. The Navy permits the integration[clarification needed] of Chile's Pacific and Southern island regions, thus integrating its disjointed geography. The transport of passengers, especially during the school year or in cases of emergency, together with the supply of provisions and fuel, are of key importance to the inhabitants of these insular zones. The institution regularly carries out civil operations whereby Navy professionals provide social assistance and health care to the civilian population, and provide support in cases of natural catastrophe. It also undertakes preventative education campaigns for Chile's population on issues that include security on beaches and seaside resorts and measures to be taken in the case of a tsunami. The most important naval bases and supply depots are (from north to south) in the Pacific Ocean: Iquique, Easter Island, Valparaíso, Talcahuano, Puerto Montt, in the Atlantic zone: Strait of Magellan and Tierra del Fuego : Punta Arenas, in the Beagle Channel, Cape Horn and Drake Passage: Puerto Williams, and in Antarctica: Captain Arturo Prat Base. These are now spread into 5 Naval Zones: the 1st, 2nd, 3rd, 4th, and 5th Naval Zones. /Anti-surface warfare (MPA/ASW/ASuW) P-3ACh Orion 3 Service life to extend past 2020. Pilatus PC-7 Turbo Trainer Switzerland Trainer PC-7 Turbo Trainer 7 Originally 10 PC-7 in fleet. 2 Further two to be acquired for new Icebreaker (Under construction) operation. Chilean Navy special forces sailors seen here using the MP5N. The Chilean Marines or (Infanteria de Marina de Chile) are the land/amphibious attack force of the Chilean Navy. The 5,000 man force combines special training and tactics with state-of-the-art equipment. Helicopters and armored amphibians for LSDH Aldea. The construction of another 3 PZM Patrulleros de Zona Marítima PZM, one for each naval zone. Elbit Hermes 900 unmanned aerial vehicle for maritime patrol tasks - under evaluation. Replacement or modernization of the L-class frigates. Ranks and rates are shown on the sleeves of all Chilean Navy summer uniforms (and on the shoulder boards on winter or summer service uniforms as well for officers and WOs only). Shoulder and sleeve ranks are inspired by those in the British Royal Navy, the French Navy and the German Navy. Officers, WOs and NCOs of the Marines add the Infante de Marina (Marine Soldier) title to their ranks from Seaman onward, as the Marines are part of the Navy. All officers, active or reserve, study at the Arturo Prat Naval Academy and later in the Naval Polytechnic Academy and the Naval War Academy receive improved training and education to be promoted as well as training in his/her specialty field while all active and reserve NCOs (known in the Navy through the general term Men of the Sea) study at the Seamen's School of the Navy "Alejandro Navarette Cisnerna" and later in the Naval Polytechnic Academy and its attached and independent colleges for later specialty training. ^ By 1911, the disparity between the navies of Chile, Argentina, and Brazil had grown; Brazil had nearly four times the tonnage of Chile, while Argentina had nearly three and a half times as much. ^ Livermore and Grant, who cites Livermore's work, both attribute part of this delay to a 1908 earthquake, but no major earthquake hit Chile in that year, cf. List of earthquakes in Chile. However, the Valparaíso earthquake of 1906 caused nearly 4,000 deaths, a tsunami, and a wide swath of destruction over the Chilean capital and surrounding areas. Given this, it seems likely that Livermore's 1908 earthquake was a typographical error inadvertently repeated in Grant's account. ^ Chile uses its national flag as an ensign. ^ Schenia, Naval History, 45–46; Garrent, "Beagle Channel," 85–87. ^ Livermore, "Battleship Diplomacy," 32. ^ Livermore, "Battleship Diplomacy," 41. ^ Livermore, "Battleship Diplomacy," 33–41. ^ Grant, Rulers, Guns, and Money, 168; Livermore, "Battleship Diplomacy," 40. ^ Esmeralda: The torture ship Archived former site of a committee led by Germán F. Westphal, a former Chilean political prisoner and a professor at the University of Maryland in the United States. They believe the ship should not be allowed in ports as long as the crimes remain unpunished. Last updated 15 March 2006. ^ "Vulcanair presenta nuevos avances en los P68 Observer 2". tallyho.cl (in Spanish). Archived from the original on 2017-06-08. Retrieved 2018-01-22. Garrett, James L. "The Beagle Channel Dispute: Confrontation and Negotiation in the Southern Cone." Journal of Interamerican Studies and World Affairs 27, no. 3 (1985): 81–109. JSTOR 165601. ISSN 0022-1937. OCLC 2239844. Livermore, Seward W. "Battleship Diplomacy in South America: 1905–1925." Journal of Modern History 16, no. 1 (1944): 31–48. JSTOR 1870986. ISSN 0022-2801. OCLC 62219150. Wikimedia Commons has media related to Navy of Chile. Official Chilean time webpage in English; from SHOA. This page was last edited on 16 March 2019, at 15:22 (UTC).